The resident drum teacher, Nick Roberts, offers one-to-one drum lessons to all ages and skill levels. Students can also benefit from access to the four practice rooms. Nick has played the drum kit for over 15 years and studied drums at The Academy of Contemporary Music graduating with a Ba Hons Degree in music performance. Since ACM, Nick has worked extensively in London with both major label artists and unsigned bands alongside a teaching and recording schedule. Performance highlights include playing at the Royal Albert Hall, the Jazz Cafe and on a national O2 Academy tour. As a teacher Nick is dynamic and enthusiastic and adaptable to the different needs of each student and likes to use a whole range of media. 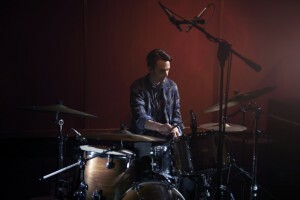 Joe Ryan teaches in the neighbouring building and works in affiliation with London Drum Studios. Joe enjoys playing across many genres from rock to electro to jazz (and everything between). He has performed internationally and in various beloved music venues in his home town including: Shepards Bush Empire, Scala, Royal Festival Hall, KOKO, and at many festivals such as Glastonbury, Bestival and Sonar. He has performed on BBC, ITV and Channel 4 and has had original compositions recieve air play on BBC, XFM and college radio stations. “My drum lessons were always my favourite part of the week when I was learning drums (not that I will ever stop learning mind you). They gave me a goal to work towards as well as inspiration and a buddy to share all of the things that excited me about music. Now that I teach I get excited about giving lessons as my students inspire me and give me a buddy to share all my knowledge with.